So Monday’s Mickey Countdown post might have eluded to this, but all week I’ll be posting the crafting that went along with our family vacation to Orlando. 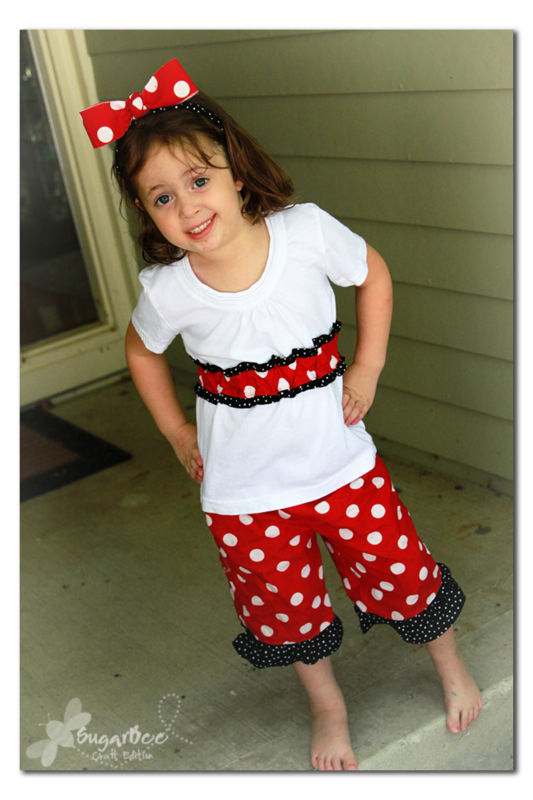 Today’s great – beware, cuteness overload on these Disney – Girl Outfits! I made the girls SUPER cute Minnie Mouse outfits. I didn’t take many tutorial pictures, because it’s pretty basic. But I can talk you through it. First I made the pants – I couldn’t decide if it would be hot or cold, so I went mid-way with capris. I just used whatever pattern I had bought on sale for $1 at Joann’s and used the red dot fabric.. Then I slightly gathered the black dot fabric and attached ruffles to the ends of the pants. 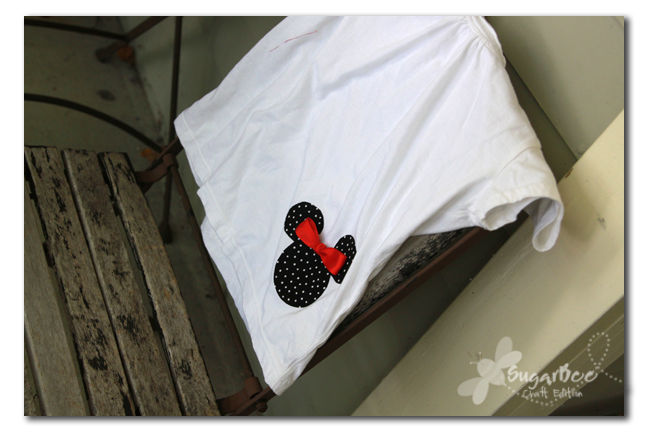 Then they needed a bow, like Minnie. 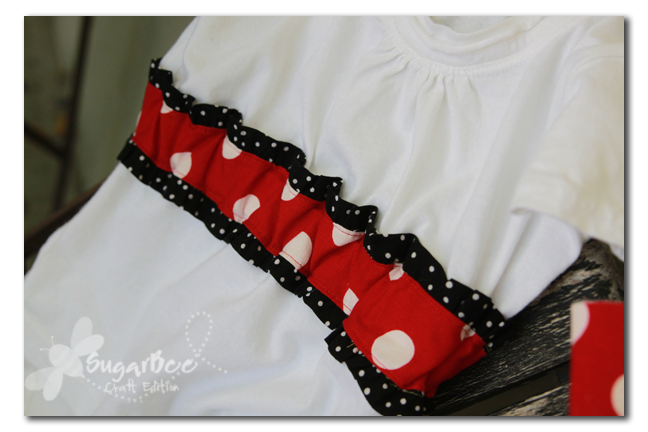 I covered headbands in black dot then made a big bow (like here, but 2 loops instead of 4) out of red dot and glued it on top. Hope it stays! The whole Minnie Mouse Outfit is really cute! I wish I could have gotten a picture with both girls wearing theirs but one is at school and it’s blog crunch time so I couldn’t wait. Oh well – I’m sure we’ll get plenty at Disneyworld. WIWW – Instagram Peer Pressure! That is such a cute outfit! So inventive of you with the mock belt – looks fab! So cute! I made something similar for my daughter for a trip last spring but ours had to have a skirt since she’s very anti-pants. I love that you made yourself a shirt too! Really very cute. Well done. They will be the most stylish girls in the Magic Kingdom! This outfit is fantastic! And I love your little applique. Very clever! Oh wow!! 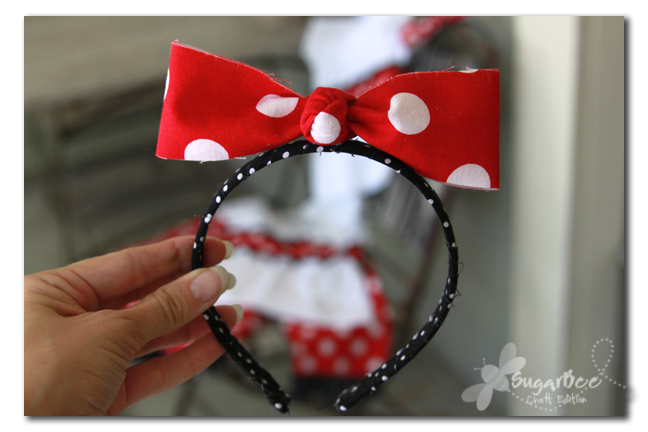 I want to make myself one for when I got to Disney!! LOL Thus, if I ever get the chance. Those are too cute! That is so adorable! I love the pants. So sweet! I bet you hear lots of “awwwwe, isn’t that cute,” while your exploring Disney. I would love to have that outfit, sadly I don’t sew. Would you consider making one for me?? My daughter is 7 and we’ll be going to Disney in Feb. Please let me know if you would and what you would charge, thank you so much. Adorable! 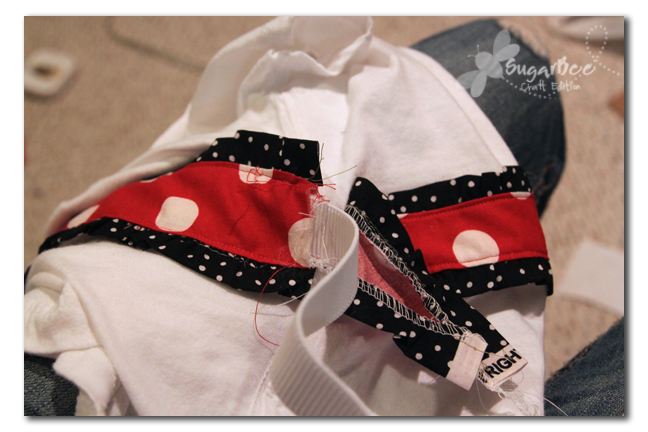 Thanks for linking @Creative Itch’s “Sew Cute Tuesday”! These are sooooo cute!You children must be soo excited wearing these at disney! SOOOO adorable! 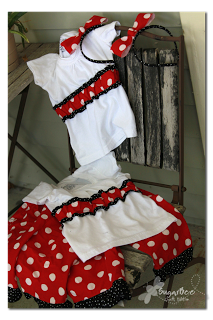 If we ever make it back to Disney I have a whole list of outfits I want to make & I am definitely adding this one!!! Awesome! Love it! I may have to use your ideas!